Unexpanded Perlite Market size is forecast to exceed USD 11 million by 2024; according to a new research report by Global Market Insights, Inc. Widespread agricultural activities across Italy, Germany and Spain are likely to make profound contribution to the crude perlite market size by 2024. For instance, agricultural land in European territory accounts for approximately 48% of the total land which signifies significant product use owing to its value adding properties including soil’s hydration and aeration properties. It’s a lightweight and better aerated substitute for soil, especially suitable for the soils in cold weather. Furthermore, neutral pH, sterile and weed-free properties enable it to be used widely in agriculture. In addition, presence of second largest metal and metal fabrication industry in Europe is another factor, which is likely to drive the unexpanded perlite market size by 2024. For instance, Europe is the second largest steel producer in the world, accounting for almost 11% of the global production. It produces approximately 177 million tons of steel annually, which signifies extensive product use in casting applications and henceforth will help attain promising gains to crude perlite market size by 2024. Availability of several product substitutes in the market, such as diatomaceous rock, barite, and polymeric foams, etc. are probable to obstruct the overall crude perlite market size by 2024. Moreover, cost inefficient production process is another restraining factor, probable to hamper the unexpanded perlite market size by 2024. Furthermore, perlite ore is harmless for humans as it can cause breathing problems that may prove to be an interruption for the unexpanded perlite market. Nevertheless, extensive R&D activities by the major perlite extractors for its use across several applications in mining, construction and industrial operations would surely create ample opportunities for the unexpanded perlite market size by 2024. Unexpanded perlite market size for slag coagulant was valued USD 1.3 million in 2016. Product is a slag holding compound and is used as a slag coagulant in induction furnaces prior to pouring in mould. It has a tendency to exfoliate at temperatures above 800-degree Celsius. It expands when it comes in contact with the melt, forming a viscous lightweight cellular accumulation. This accumulation attracts all individual slag particles in metal and cleans the metal by coagulating up them all. It also helps in minimizing phosphorous and Sulphur content in the melt. Other advantages offered by unexpanded perlite as slag coagulant includes reducing radiant loss of heat, reducing emission of toxic fumes, etc. Increasing demand for slag coagulants in oil rigs and refineries will help have positive influence on crude perlite market size by 2024. Unexpanded perlite market size for Europe accounted for more than 25% of the total industry share in 2016. Crude perlite products have widespread application in the cold weather European countries across agriculture sector. This is mainly due to less hydrated soil in the cold weather and henceforth perlite aids in enhancing the hydration and ventilation in the soil. Additionally, presence of several mines in the region signifies increasing product use by 2024. For example, nearly 200 mineral mines are discovered around Milos in Greece. Milos is an island which is formed by the earthquakes, tsunamis and volcanic eruptions from the Aegean Sea. Owing to all this natural phenomenon a complete geological island is formed, which will augment the overall unexpanded perlite market size by 2024. 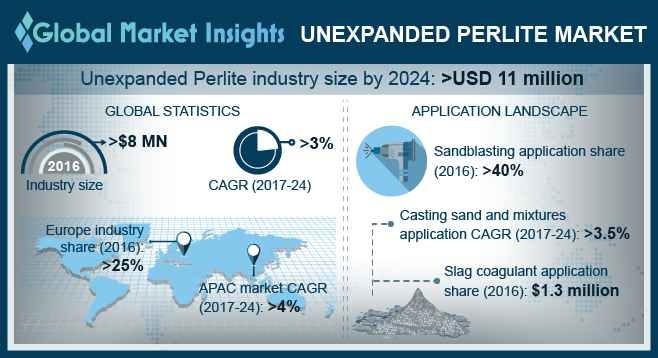 Major unexpanded perlite market size contributors are Cornerstone Industrial Minerals, Imerys SA, Perlite-Hellas, The Schundler Company, Gulf Perlite, Hess Perlite, Midwest Perlite, Perlite Vermiculite Packaging Industries Inc. and Dicalite Management Group. Major players are engaged in forming strategic alliances with small or medium players. For example, the company acquired S&B, a major Europe-based player in the industrial minerals market in February 2014 the acquisition is expected to provide operational synergies to the company, alongside expanding its product portfolio to improve its footprint in Europe.